If you want to revert the configs to use ECC (Embedded credential Collector), Make sure you uncheck the option "Allow Credential Collector Operations" in Webgate configuration. 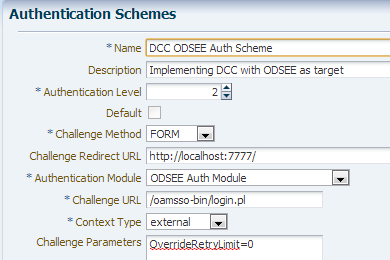 Is DCC is only possible with OHS server which having 11g webgate, as i dont see these option in 10g. Is there any setting / configuration available in OAM / OAM Webgate to hide the User-agent(in HTTP request / response) ? Can we comment out this attribute in login-config.pl so that its not printed as comment in the page? I followed through all the settings as mentioned in this post, but still its throwing this error when I submit the credentials. The creds are correct, the scheme is right. Also, the redirect to oamsso-bin/login.pl is working fine. Any help is appreciated. did you protect the resource? And do you see any other error in Access manager or web agent logs??? Thats all. Nothing more of a error code except OAM-2073.